As you may know, I have been on the look out for novels set in Australia during and around the First World War. So when a copy of Pamela Hart's newest novel arrived in my mailbox, I made time to read it right away. The Desert Nurse is the story of Evelyn Northey, the daughter of a doctor living in Taree in the early Twentieth Century. She longs to become a doctor herself, but after her mother passed away, her father insisted on her leaving school to help run the household and take care of her younger brother. Evelyn dreams of the day that her inheritance from her mother will become available to her so that she can use the money to go to University and become a doctor. But she's in for the shock of her life on her twenty-first birthday when she discovers that the terms of her mother's will state that she will only get the money when she turns thirty or when she marries-- meaning that she is to be at the mercy of her father or her husband until it may well be too late. Desperate to follow her dreams, Evelyn trains to be a nurse at the Manning District Hospital, and thanks to the assistance of one of the doctors there, becomes a certified nurse. When war is declared and nurses are needed, despite her father's protestations, Evelyn enlists. It is at her medical examination that she meets William Brent, a doctor who is unable to enlist himself because of a childhood bout of polio that has left him with muscle damage in one of his legs. William and Evelyn meet again, however in Egypt, after Dr Brent decides to just show up at one of the hospitals and offer his services. With the incoming casualties from Gallipoli and the Dardanelles, the army find they are unable to turn away the talented surgeon, and soon he and Evelyn are working side by side in theatre. 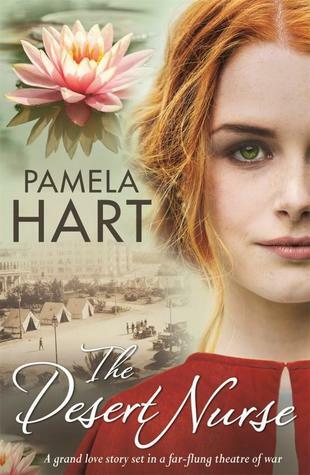 Pamela Hart's books move along at a cracking pace. Her books always follow a strong, lovable heroine doing something against the restrictions imposed on her by society, and I really enjoy putting myself in the shoes of a person who lived long before me. At times, the pace almost seemed too quick in this book, particularly in the early parts, but I was soon swept away once the novel and its cast made it to the war. One thing that is very clear is that Pamela Hart has done a lot of research, particularly about medical procedures and wartime hospitals. The places and the people in them felt supremely real. As is normal in Pamela Hart's books, characters from her previous novels The Soldier's Wife and A Letter From Italy made cameo appearances. If there was mention of the characters from The War Bride, I missed them as it's been a while since I read that book. The Desert Nurse is a quick read but a heartwarming one and one I am going to return to again in the future. I loved getting a woman's perspective on the war and on what it was like to be a woman around that time. It made a lovely counterpoint to a book I read earlier in the year, The Daughters of Mars by Tom Keneally. While both essentially dealt with a similar situation, the books were very different in their scopes and styles. I look forward to more books from Pamela Hart.